Within only a few years, PP-Elektronix has become one of the leading electronics manufacturers in Poland. Maintaining a continuous high quality level has made its name known throughout Europe, America and Asia. By using production machines from Essemtec, Switzerland, PP-Elektronix can provide a highly flexible full service. Inventing new ideas and solutions to satisfy customer needs is a continuous challenge for technicians working for PP-Elektronix. The company, based in Lublin, Poland, offers custom, high-quality electronics manufacturing services, combined with comprehensive component management and testing. PP-Elektronix is a dynamic team of specialists, most of them educated at the Faculty of Electronics at the Technical University of Lublin and many of them working for the company since its founding nine years ago. When Piotr Policha founded PP-Elektronix in 2003, he already had many years of experience in electronics manufacturing. He focused on the assembly of products that other manufacturers could not or did not want to do. Manual productions of unusual or highly complex boards were his market niche. In the beginning, these services were offered only to small- to mid-size enterprises in the Lublin region. But the quality of PP-Elektronix was outstanding compared to others and, as a result, the company grew quickly, winning customers from all over Poland, Germany, the United States and even Japan. In 2009, electronics production was automated to accomplish the increasing production volume and to manage the increase of complexity and the miniaturization of electronics. PP-Elektronix's main focus is on specialties and small series. Therefore, the automatic production line must be highly flexible and product quick changeover. Furthermore, it must be able to assemble whatever the customer needs. Based on these requirements, PP-Elektronix decided to install a production line from Essemtec, Switzerland. The Essemtec FLX2011 pick-and-place machine used by PP-Elektronix offers a wide application range to accommodate PCBs of various sizes and shapes. The machine's footprint is smaller than 1 sq m and the placement speed is up to 6,000 components per hour. Therefore, PP-Elektronix produces more than 1,000,000 pieces of SMD components per month. Due to the high feeder capacity (190 reels) and the intelligent feeder system, the machine can be changed from one product to another quickly and without errors. FLX2011 places all types of components from 01005 up to large QFPs and BGAs. It also can be equipped with a dispensing system, allowing solder paste or glue to be added before placement. The FLX software allows quick adaptations and last-minute modifications of boards. Its virtual view features on-screen control of placement quality before a single component has been placed. As such, it perfectly suits the needs of PP-Elektronix for high-quality, highly flexible assembly of small- to medium-size series and of complex boards. The RO300FC full convection reflow oven from Essemtec also suits PP-Elektronix's needs for high quality and high flexibility. Soldering of complex SMD PCBs requires an exactly controlled soldering process. The RO300FC offers fast, homogenous heating and excellent control of the temperature profile. The integrated convection technology offers a unique, innovative and efficient way of heating with a vertical hot air stream that evenly heats the complete PCB. The RO300FC allows PP-Elektronix to offer standard and lead-free soldering. The oven also enables soldering highly complex boards and sensitive devices such as BGAs and LEDs. Equipped with a chain conveyor, both single- and double-sided PCBs can be soldered. The RO-CONTROL Software enables the simulation of soldering profiles at different settings and the comparison with a solder paste library. The number of profiles managed with RO-CONTROL is unlimited. The software also controls and supervises the reflow oven, ensuring a save operation. A saved parameter set can be selected from the profile library and can be transmitted to the reflow oven. RO-CONTROL steers and supervises the oven, and the actual status is displayed on the screen. Additionally, the paste editor allows the design and save profile references for different solder pastes. These references can be used by the profile simulator for comparison. The software also has the capability to save the process changeover to a lead-free process. Maintaining highest quality level for each product manufactured has been one of the most important success factors for PP-Elektronix. The company keeps the demanding high level of services by using state-of-the-art production processes in combination with highly experienced staff. The staff motivation stays high because it is not only realizing current orders but searching daily for new ideas and solutions to improve the company's competitiveness. 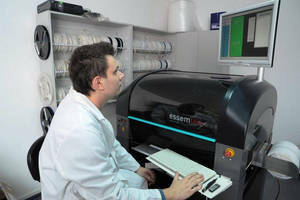 PP-Elektronix is currently in the process of implementing automatic optical inspection (AOI) into the production chain. Furthermore, the company is close to being compliant to ISO 9001:2001 and ISO 14001:2004. PP-Elektronix produces for demanding customers in telecommunications, medical, automotive and other high-quality industries. In 2011, PP-Elektronix was one of the first subcontractors to introduce a comprehensive component service in Poland that includes component purchasing, labeling, and compliance tests for standards and CE certification.